Since becoming a mum I feel like my multi-tasking skills have increased exponentially. I wash dishes, make a cup of tea, feed the kids a snack and wipe noses all seemingly simultaneously. It is a part of life, a part of living with two little ones. But this multi-tasking has created in me a fracturing. I have things continually half done, I move from one room to another and find that I can’t remember what I was in the midst of doing, because I have already moved on to the next thing to do. I find that I can’t seem to stop the speed of things, or the number of things I have to be doing at once. This is contrary to my need to write. I can’t write while playing with the girls, and cooking. I can’t write while having a meaningful conversation with my husband, and reading a book. These things naturally cannot occur in the same space. Yesterday I drove for half an hour to see a friend who lives by the sea. Bubba Girl fell asleep in the car, and I had time to focus on one task. I wasn’t talking to anyone, I just listened to my music and drove, enjoying the beautiful day and the scenery beside me. So today I am being intentional. I am being intentional about slowing down, I am being intentional about focusing on one task at a time, I am being intentional about entering into that task with my full attention. Whether it is tidying a room, or playing with my girls, or cooking, or writing. 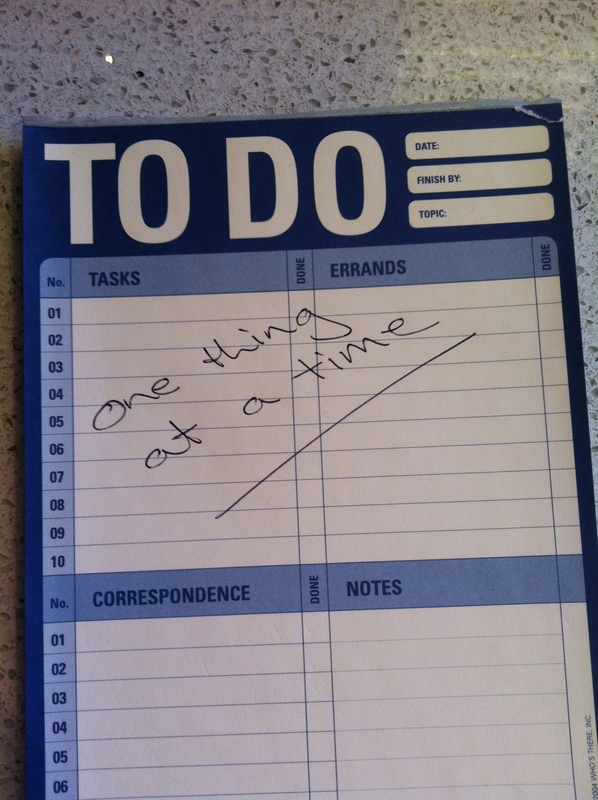 Today I choose single-tasking. Let’s see how I do.